Lighten your workload: Throwing darts is fun – managing league standings and schedules is not. This is the first in a series of new tools to make your job easier than ever. Any team that uses the scoring application will have their league points automatically updated, removing this task from your weekly workload. What if a team makes a mistake? Instantly edit the match score without affecting the match report. If your league utilizes a complex league point system, that includes win and sweep bonuses, you now have an easy override. What about teams that are not using the scoring application yet? The teams using DartConnect have just reduced your workload further. 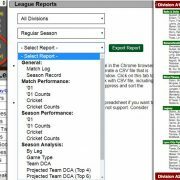 To avoid having to maintain division standings in two systems, the league portal provides the option of creating match scores for missing match reports. With less effort than ever, you now have a single location for tracking the season. After just one season with DartConnect, leagues can “forecast” each team’s potential, even when player rosters change. As long as a player has participated in one of the three prior seasons, DartConnect will aggregate their performance with the rest of the players on the team. League administrators can download an excel spreadsheet, enabling them to sort and rank each team’s potential. What about new league players? If a player is transferring from another DartConnect league, or have participated in DartConnect tournaments, leagues can research their performance to determine how that player’s average will impact their new team’s projected performance.